In the course of long operation of buildings in the Foundation may occur deformation. This can be judged by the appearance of horizontal cracks in the facade, the basement, the walls of the house. If the Foundation is shrinking, it is recommended that it be strengthened. The choice of technology of strengthening of the Foundation depends on the condition of the building and its subsequent reconstruction is possible, from the design features of the structure and condition of the soil. In addition, great importance is the equipment of the organizations performing the work. Limit the sealing of cracks with cement mortar, if they are small and shrinkage of the Foundation stopped. This cracks embroidered and complete solution in the ratio 1:3. If the precipitate is large, try to establish and eliminate the causes of its occurrence. The deformations of foundations caused by the soil washing away, have resorted to the technology of injection of cement mortar into the void. In the Foundation of the Buryat injection wells and high pressure pump solutions that fill voids, impregnated and compacted soil. Layer of special solution strengthens the Foundation and serves as a great waterproofing layer. If a special technique for drilling and infectionany missing, such work may be performed manually. To do this around the perimeter of the Foundation, or only in problem areas dug into the soil below the base. Dig a trench, fill it with stone masonry or monolithic concrete. This will provide a rigid bundle with the total array of the Foundation. Don't make breaks between the concrete and excavation work, it can lead to devastating consequences. 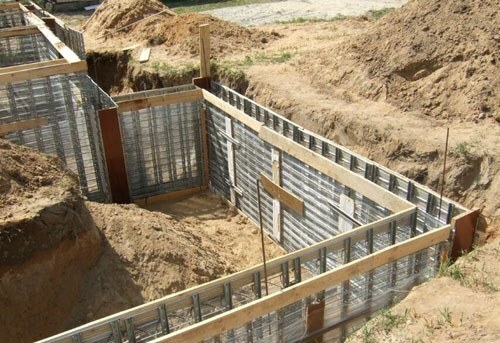 This reinforcement is optimal with a superstructure another floor, if the bearing capacity of the Foundation is questionable. Strengthening the foundations of massive buildings produce by the installation of additional piles. To do this around the perimeter of the building near the old Foundation were drilled wells with a diameter from 100 to 300 mm in a staggered manner at intervals of 10 cm and Then seemywife them and pour concrete. Bored piles connected with Foundation anchors. To strengthen the Foundation you can also use concrete clips. Dig a trench along the belt or along the perimeter of pier Foundation. Then the surface is carefully cleaned from old plaster and dirt. Hammer in the design of Foundation anchors of reinforcement. Install along the base of metal mesh, attaching it to the anchors. Then install the formwork and sebaconitrile. After curing the concrete trench fill in layers and carefully strombolite. Anchoring should be done so that new areas of the Foundation holding the weight of the building together with the old. Repair Foundation requires compliance with the safety requirements of the work and careful preparation. The slightest negligence can occur in the collapse of part or even the entire structure. Therefore, the performance of such work, use experts.